With his contract situation continuing to make headlines, Unai Emery has revealed that he just wants Aaron Ramsey to keep his head down and work hard for Arsenal on the pitch. As per The Express, the Welshman has yet to commit his future and sign a new contract at Arsenal despite his current deal being set to expire at the end of the season, with his demands for a wage increase being touted as a possible issue. The 27-year-old has been with the Gunners since 2008, making 331 appearances for the club and has won three FA Cups in that time as he has established himself as a key figure. 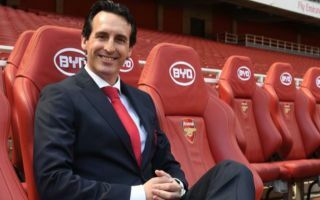 However, the uncertainty over his future could potentially be an unwanted distraction from focusing on his ability to help Arsenal bounce back from a difficult start to the season and so the message from Emery is simple, focus on football. “I said: I want you focused only on training and only on the match, you show us the capacity to help the team,” he is quoted as saying by Sky Sports. The Gunners have lost their opening two games of the Premier League campaign against Man City and Chelsea respectively, and so they’ll be desperate to get on the board when they host West Ham United on Saturday. Ramsey remains a crucial player in midfield with his creativity and ability to make timely runs forward and score goals, something that Emery arguably doesn’t have enough of in his current options in that department. In turn, the sooner he can reach top form and help the team, the better the situation will surely be for all concerned while also potentially showing Arsenal that he’s worth the ongoing faith and investment moving forward.